Alexander went back to Babylon in 324 BC. Then a man named Chandragupta overthrew the old Vedic kingdom of Nanda and formed a big new empire. He ruled all of northern India and into Afghanistan. 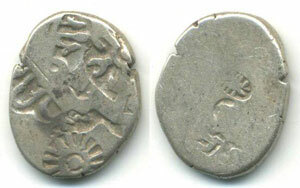 Greek historians said that Chandragupta got the idea from Alexander. But it seems more likely that, like Alexander, the Indians got the idea of forming empires from the Iranians. Or maybe he got the idea from earlier Vedic empire-builders in India. Chandragupta conquered the Indus valley back from the Greeks. As part of the peace treaty he married the daughter of Seleucus, who had succeeded Alexander. He gave Seleucus 200 elephants. There was a lot going on in the Mauryan Empire. The Silk Road was getting started. Indian traders sold cotton cloth, pearls, pepper and cinnamon to their northern neighbors, the Sogdians and the Greeks. They bought fast horses and silver. These traders brought the new alphabet back to India. People used their version of that alphabet to write down the Rig Veda, the Ramayana, and the Mahabharata for the first time. As India got richer from trade, the Mauryan kings built the first Buddhist stupas. Then they carved Buddhist temples into the cliffs at Ajanta – because Buddhism was also growing rapidly under Mauryan rule. People in India began to use water wheels for irrigation. They began to make steel to sell on the Silk Road. Even Hinduism changed: apparently new ideas about karma and dharma came into the faith, possibly from China. Old Hindu gods like Indra lost ground to new gods like Shiva and Vishnu. Chandragupta died in 298 BC and his son Bindusara took over. Bindusara’s son Ashoka made the Mauryan Empire even stronger. He ruled some of southern India as well as the north. But Ashoka’s victories at Orissa were so bloody and awful, that (at least according to tradition) after that battle he gave up warfare for the rest of his life. 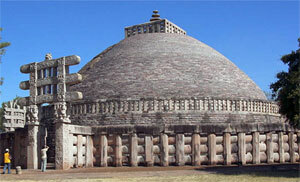 Ashoka converted from traditional Indian Hinduism to the new faith of Buddhism. Then he used his power to convince millions of other people to convert to Buddhism too, all over Central Asia. After Ashoka died in 231 BC, though, his sons and grandsons were not as strong rulers as he was. The Mauryan Empire gradually fell apart into a bunch of smaller kingdoms. Note: The first of these is a comic book, but it’s a good story! Cite this page: Carr, K.E. Mauryan India – history of India. Quatr.us Study Guides, July 20, 2017. Web. April 20, 2019.